1. Inform your Local IT Support staff that you wish to install the Skype application on your computer. The support staff must ensure that your local area network is adequately firewalled to protect the network. 3. Install a software firewall on your computer. The following installation steps are to be followed when installing Skype. These steps will prevent yourmachine frombecoming a supernode. Download latest version of Skype. Run the Skype setup wizard. a. After you have checked the "Read and understood License agreement" box, select the "options" button. 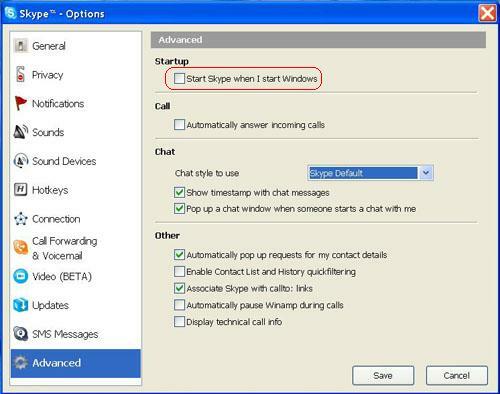 b. UNCHECK the "Start Skype when the computer starts" checkbox. If you do not do this Skype will always be running in the background. Note: If Skype runs in the background all the time there is a very high probability your machine will become a supernode. a. Close Skype when you are finished using it. Skype is one of those programs that minimizes to the system tray (icons along the bottom right hand corner of your screen) when you close the window, but keeps running in the background. To actually close Skype you must right click the system tray icon and select 'quit'. b. Only open Skype when you are going to use it. Skype is a security risk (because its use of encrypted tunneling prevents virus protection) and the longer it is left running the greater the potential for your machine to become compromised or infected. The following configuration steps are suggestedif you already have Skype installed.These steps will help preventyourmachine from becoming a supernode. 2. A window will open. Click on the Advanced Tab on the left. 3. At top of window there will be a check box marked Start Skype when I start windows. UNCHECK this box. 4. Click the save button in the bottom right hand corner of the window.